For the traveler who is unable to make a trekking trip to the mountains either because of lack of time or physical fitness, or due to sheer want of the adventure streak, there are mountain flights to simulate the experience. The one hour flight takes you within camera range of some of the heights peaks in the world, and crusing this close to the awe-inspiring massifs of rock and ice, is an out-of-this earth experience. The aircraft takes off and heads eastward and almost immediately, the peaks come into view. The first peak that appears in your horizon is the majestic Gosaithan, standing 8,013m tall. To its right, appears Dorje Lakpa (6,966m), looking like a massive figure of 8, lying prone and covered in snow. To its right is Phurbi Chyachu, which looms over the Kathmandu Valley. Next on your vision is Choba Bhamare, rather than small in this company at 5,933m, but singularly stubborn as it remains unconquered to this day. Then comes Mt. Gaurishanker (7,134m), standing out sharp and conspicuous-Hindus believe that lord Shiva and his consort Parvati protect this mountain. As the flight moves towards the eastern Himalaya, a succession of majestic mountains follows. Melungtse, with a plateau-like top stands at 7,023m; Chugimago is at 6,297m, and still remains to be scaled. At 6,956m, Mt. Numbur resembles a breast, and is believed to be the maternal source in the sky providing pure milk to the Sherpas of Solukhumbu. Then, Karyolung, a gambling–white mountain at 6,511m, and Cho-Oyu, the sixth highest in the world at 8,021m. The last and most exciting stretch of the journey takes you close to the 7,952m tall Gyachungkang, which is considered an extremely tough climb. To its right is Pumori at 7,161m and Nuptse at 7,855m. Finally, there is Mt. Everest itself (8,848m), called Sagarmath by the Nepalis and Chomolungma by Tibetans. It is an altogether different feeling as one comes face to face with the world’s tallest and most enigmatic of the mountains. Mountain flights are offered by a host of airlines. Buddha Air offers several flights a day, the other being Gorkha Air, Necon Air, Mountain Air, Cosmic Air and Royal Nepal Airlines. 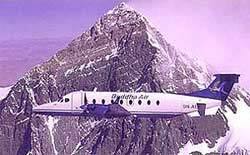 All the flights leave Kathmandu between 7.00 and 9.30 a.m. Buddha Air flies 19- seater American Beech 1900D aircraft. Gorkha airlines and cosmic air operate 19- seater German Dornier 228s. Mountain air lies 1900C Beech aircraft, RNAC operates 44-seater Avros and 19-seater Twin otters, while Necon Air has 44-seater Avros and ATRs. Please check timing with local operators.